Photo of a tropical Waterhen with a bounty making a dash to the bushes. The White-breasted Waterhen (Amaurornis phoenicurus) is a waterbird of the rail and crake family Rallidae that is widely distributed across South and Southeast Asia. They are dark slaty birds with a clean white face, breast and belly. They are somewhat bolder than most other rails and are often seen stepping slowly with their tail cocked upright in open marshes or even drains near busy roads. They are largely crepuscular in activity and during the breeding season after the first rains make loud and persistent croaky calls. In Sri Lanka, this bird is known as Korawakka in Sinhala Language. 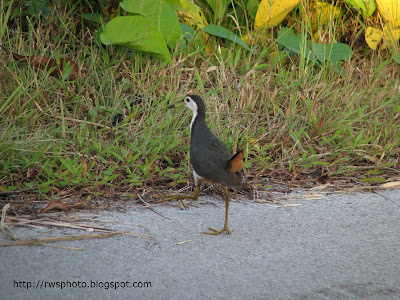 In Sarawak Borneo, this Waterhen is known as Manuk Keruak in Bidayuh Language. 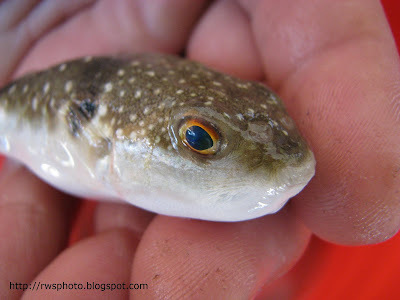 Photo of live tropical freshwater Puffer Fish (Ikan Buntal). The Ikan Buntal was caught at the muddy Siar Beach, Lundu. Ikan Buntal probably belong to Tetraodontidae family. The small Ikan Buntal actually feel like a frog with soft tissue. Closer shot of Ikan Buntal. Tetraodontidae is a family of primarily marine and estuarine fish. 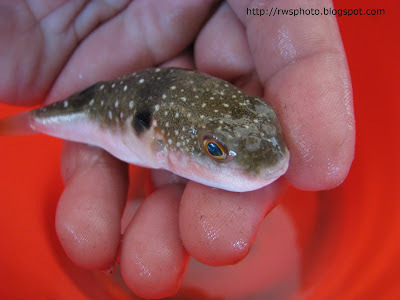 The family includes many familiar species which are variously called puffers, balloonfish, blowfish, bubblefish, globefish, swellfish, toadfish, toadies, honey toads, fugu and sea squab. 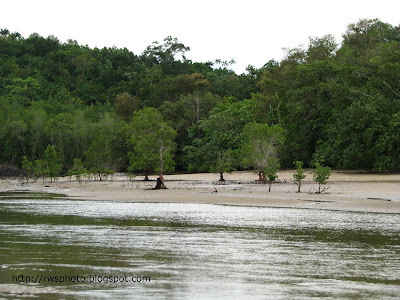 Photo of Siar Beach, next to the Siar Beach Resort Lundu which is about one hour drive from Kuching. Beach view facing a mountain shrouded with morning mists. 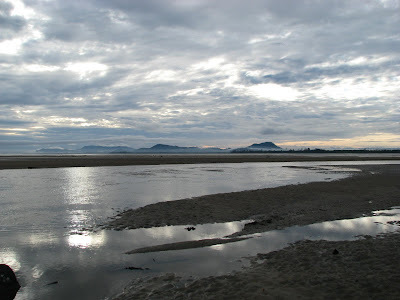 Siar beach at low tide. 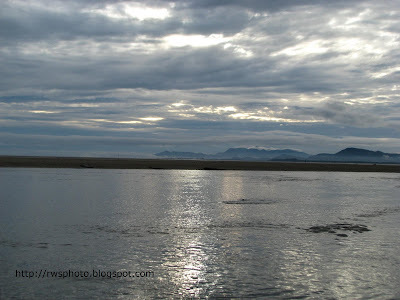 Fresh water from the mountain flowing unto the beach at low tide. 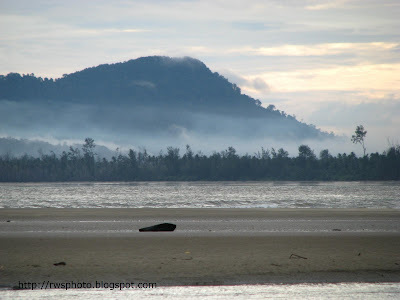 A distance view of the mountain from Siar Beach. The sea at the far end of the beach. Siar Beach Resort occupies a secluded, peaceful and tranquility beach front with self contained bungalows units and basic facilities. Unfortunately, there is no white sand but sandy and muddy beach. Link to Siar Beach Resort home page. Be sure to bring enough drinking water because when I stayed there, water supply (which is from the mountain source) was cut off during the night during a heavy storm. I suppose water supply is not an issue during fine weather. 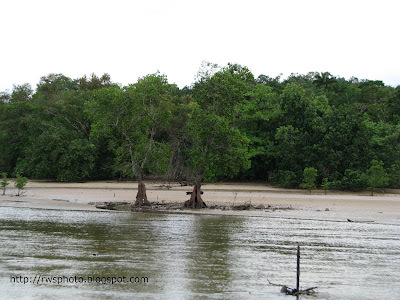 Bring your food rations as well as unless you prepared to drive back to Lundu town for a meal. As for the beach, probably a one-star rating due to the fact that the main sea water body is far from the beach (approximately 500 meters away during low tide) in addition to the unsightly debris. And I cut my toe when I accidentally kick a submerged rock which was unseen due to the murky water.